Mehndi designs for hands: Every woman love to apply mehndi to their hands and legs. This mehndi practice is most widespread throughout the world. Especially in countries like India, Pakistan and other Arabian countries you can see the insane craze for mehndi designs. If you have a glance at marriages and functions in countries like India, Pakistan you can find the interesting thing that is without mehndi there will be no marriages. That is the real craze of mehndi in those countries. Women in those countries always feel incomplete without mehndi in important rituals. Here Mehndi is not just loved for its beauty it provides, but it is also an important part of the whole marriage. From the ancestors, there is a belief that mehndi brings happiness. Going to the good old days, mehndi is taken from the Sanskrit word that is Mendhika. Previously ancestors used the turmeric and henna paste as mehndi, and it is also being supported by Hindu ritual texts and history as well. Mehndi came from the plant Lawsonia inermis. This is a scientific name of a mehndi tree, but usually, in India, people just call this tree as mehndi tree or henna tree. Here in India women just adorn themselves with the artistic mehndi designs for hands and legs in each occasion. Women always try to be unique and different than others, so they use different mehndi’s as well. There are different types of mehndi readily available in the markets like red henna, black henna, stones, and glitter, etc. Here the variety of colours is just used to decorate the mehndi designs. If you don’t like those, then you can go with standard and traditional mehndi. You can see yourself each, and every hand looks fabulous with mehndi. And in fact, these days’ mehndi has become popular in countries like the USA, UK, and Australia. But here they were designs as some temporary tattoos. As women are always eager to know new mehandi designs for hands and legs. 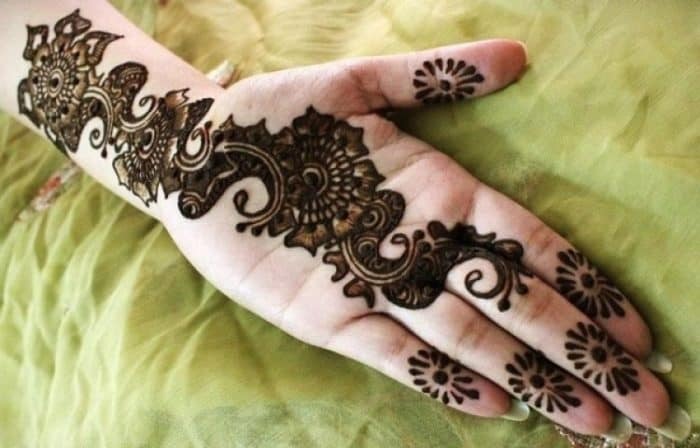 Now let’s see the best and beautiful mehendi designs for hands in this article. 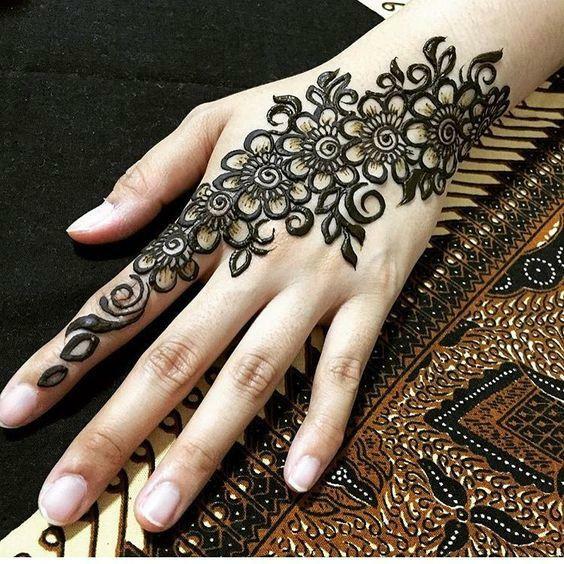 Now let’s jump into the best mehndi designs for hands. It always best to start with them for hands. Here the mehndi itself is a well know and traditional one so you can find numerous designs and patterns for your hands. Which simply reflects your tradition in your hands. Here the traditional mehndi is not a single design. Every design which has the floral designs which cover all your hands and arms beautifully without leaving any space in between. This process is a traditional mehndi style process. Usually, this is the first choice of any mehndi lover for marriages and other types of ethnic occasions. The simple mehndi design is nothing but the floral design. Here this kind of simple mehendi designs for hands is perfect for casual gatherings and college functions. This design includes a simple floral pattern with no intricate style. You can quickly draw this with a little practice of free hand mehndi art. Here in this design, you can even draw lovely motif pattern with two leaves and one dot. In this design most part of your hand is not covered with mehndi. So this is best and simple mehndi design for hands for standard functions. The bride and groom mehndi design is one of the best wedding mehndi design for hands. This is a splendid mehndi design for the brides, and it looks beautiful on the wedding occasions. You can use flowers, leaves, and other lovely shapes in this mehndi design. You can even combine all of those together to complete the bride and groom mehndi design. This design is not that easy it can be effective only when you are an expert mehndi designer. These days you can see bracelet mehndi designs more than other mehndi design modern parties. The simple bracelet mehandi designs for hands are just the rising mehndi designs these days. Although these designs are simple they are incredibly powerful when you have a glance at the look of conception. This simple design will suit every girl, and it is very stylish. If you are up with fashion trends, then you can make use of this lovely design to get a new look. Bangle mehndi is another type of mehndi. Here you don’t have to wear bangles separately you can just paint them in an excellent floral design or other design on your wrist. These types of designs are beautiful and elegant. You can see these kinds of beautiful swirls and curls wound around your wrist to give the appearance of bangles. If you really love having a compact intricately mehndi design, then you can use this elegant Indian mehndi. It is a unique design which fills up your entire hands with the floral patterns, lace and other bold and prominent things. Indian mehndi is one of the best mehndi design which gives you glamorous look on any occasion. This type of mehndi design matches all designs. Arabic mehndi design is another lovely mehndi design. This style includes only the evergreen and attractive floral patterns which are suitably arranged in a sequence. All the flowers are made of the same design and same thickness as well. Here consistency is the main part of Arabic mehndi designs. You can see all the petals are filled with thin lines which give unique touch to your design. This design will have a covered mehndi only at the index, and mid fingers rest is left blank. If you are the beginner, then you can start with this design. There are numerous beautiful hand mehndi designs these days. You can see floral mehndi in almost of types of designs but here coming to the floral hand designs, you can just use motifs and leaves to make some design. This starts from the wrist, and it almost covers all the parts of your palm. In your fingers, you can see tiny leaves pattern which looks amazing. Usually, there are a lot of Punjabi mehndi patterns which can use in any occasions. But when you speak about the best mehndi pattern then obviously, the Punjabi peacock mehndi design is simply excellent. It is the most popular mehndi design. Here all the design is the peacock. Most of the brides often opt this peacock design. The hand mehndi design with rhinestone is simple yet effective design. If you really want to touch the extremes of the simplicity. Then you can choose this design because this is a glamour design which is very easy to draw and less time-consuming design. You can see different styles in this type, but each and every type will have the addition of tiny rhinestones at various places on each finger to make it look appealing and different to others. This ravishing design is perfect for all the working women who have very less time to their beauty and designing. Until now we have seen ten best and beautiful mehndi designs with description. Now let’s see the other 15 without description. So that it can be easy for you to select the style with pictures. I hope you all liked these styles. If you think I missed any of your favorite style on this list, then you can suggest that design in the comments section. Every woman loves to apply mehndi to their hands and legs for fashion and parties. Henna art or Mehendi is quite fondly applied on each and every occasion to embellish something.